Heirship can be defined as a person’s rights as designated by law to succeed to the ownership of property of a decedent if that decedent does not make lawful disposition of it by will. Heirship is a legal right to an inheritance. Whenever someone dies without a will, Heirship proceedings may be filed to determine the person who is entitled to the property. The surviving spouse and heirs of the decedent shall be made party defendants. After service of a summons and a Heirship determination proceeding, the court will determine the heirs or next of kin of the decedent, and who will inherit the estate. File an Affidavit of Heirship once all interested parties are notified. A hearing in a court of law on Heirship Determination will be held. An Heirship decree naming the heirs of the property will be administered by the judge. 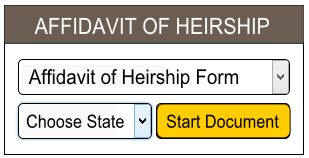 Fill out and print a free Affidavit of Heirship form in five minutes online.